I have a big problem. I'm getting the "CPU Fan Failure" message on startup and I've done a few things to try to get rid of it. It started displaying this message after I took my whole system out of the original HP case it came in and put it in a bigger, better case with more fans for better cooling. I'm going to list how I've tried to fix it since..
1)Unplugged the 3-pin fan connector and plugged it back in. 2)Replaced the fan on the stock heatsink with a different fan. The first time i booted after replacing the fan, there was no error message but after that, there was. 3)Bought an entirely new CPU Cooler (CoolerMaster Hyper N520) and plugged it into the same 3-pin CPU Fan port.... same problem. Another interesting element of this problem is that the case fan on the back of my computer will not spin when plugged into the System Fan port on my motherboard (although the LEDs turn on) but when I check temperatures on SpeedFan, the CPU at idle is 26 degrees C. However, when i plug it into a regular 3-pin fan connector, it works but the CPU temperatures go from 26 degrees C to 40-41 degrees C.. I'm almost positive that for some reason the CPU fans aren't spinning fast enough and that's why it's hotter than it should be but I don't know. If somebody can help me out with this issue it would be greatly appreciated. I have seen fan headers on the motherboard go bad for whatever reason. 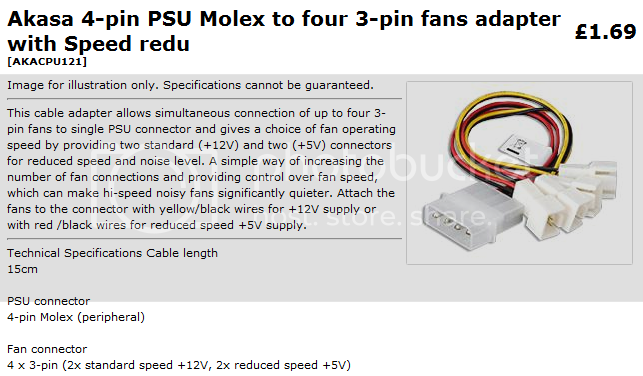 If you plug the fan into a y adapter from the power supply, the fan will be spinning at max speed all the time. Good for cooling, not good for noise. Well now I got the fan speeds working how they should with the assistance of SpeedFan. (73-75 degrees F idle) However, I'm still getting the error on startup..
Can't you disable the warning in the BIOS? I didn't see any option of that sort in the Hardware Monitor. I'll check again in case I missed it. Figured it out, I just turned off the System Fan Check. That doesn't matter because there is no fan plugged into the system fan port anyways but thanks for the help guys.